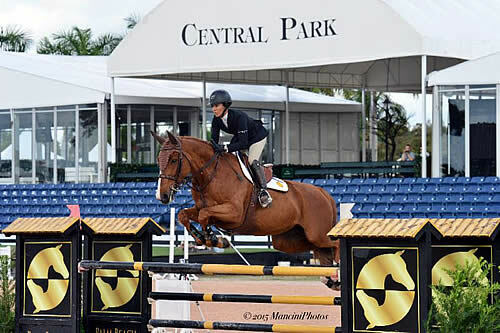 Wellington, FL (March 11, 2019) – Friday and Saturday at Jim Brandon Equestrian Center showcased two of jumping sport’s most prestigious classes: the Grand Prix and the Hunter Derby. As the ninth weekly Turf Tour Grand Prix of 2019 and the final Hunter Derby Day of the year, the past week’s Turf Tour at Jim Brandon Equestrian Center marked the beginning of the end of The Ridge’s 2019 Florida season, with just three weeks left to go. Bluman Takes the Blue: A frequent victor and competitor on the Turf Tour, Daniel Bluman and Blue Star Investment’s Colestina H put in an athletic performance in the $15,000 1.40m Grand Prix to win the class on a jump-off time of 24.312. Picking up where his student, Samantha Wight left off as the winner of Wednesday’s 1.30m Rising Star Classic, Bluman and Colestina bested a field of more than 20 Grand Prix competitors who ranged from young riders to veteran international show jumpers. Sarah Scheiring finished second and third aboard Dontez and S&L Cocodrille. With just three weeks to go, the cumulative points leader in the 1.40m Grand Prix, 1.30m Rising Star, and 1.20-1.25m Turf Tour divisions will win a new custom golf cart presented by Iron Horse Transit, the official horse carrier. Spectacular, Enchanted, Unbelievable: The final Hunter Derby Days of 2019 proved to be a battle of titans. Peter Pletcher, Kelley Farmer, and Havens Schatt, along with their talented mounts, demonstrated the talent, athletic ability, and grace that has made them some of the hunter ring’s most decorated names. Havens Schatt and the bay stallion Spectacular ultimately clinched the top prize. Edging out Kelley Farmer and Enchanted by just a half a point, both riders’ flawless rounds were a testament to the beauty and power of the sport. Not to be discounted, Peter Pletcher and Unbelievable’s elegant rounds earned him 3rd behind the two ladies. Earlier in the day, Amy Foster and Jasper secured the final $5,000 USHJA National Hunter Derby, with Quintus P. J. and Miranda Scott finishing second and Legolas and Stephanie Clark in third. A special treat for all of the riders, owners, grooms, staff, and spectators, The RV Advisor hosted a gourmet lunch between the National and International Derbies. Their roadside assistance, which provides towing as well as transport for horses and humans, is the ultimate peace of mind for equestrians on the road. Wilhelm Genn and Bugatti. Photo by Anne Gittins Photography. Lexington, Ky. – June 11, 2018 – The first week of the Country Heir I & II Horse Show at the Kentucky Horse Park showcased of some of the finest hunters and jumpers in North America. 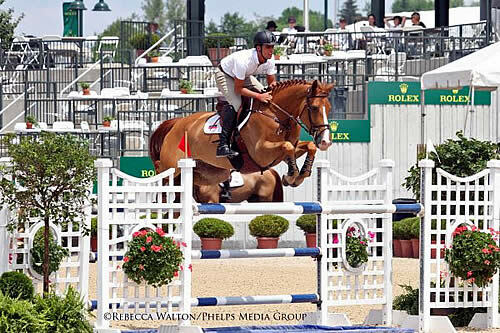 An audience gathered to watch exciting show-jumping action in the Rolex Stadium Sunday. International course designer Steve Stephens and his team set the track for a lively afternoon of sport. Of the 30 entries, eight left all the rails in the cups and progressed to the jump-off round. Wilhelm Genn (GER) and Bugatti, owned by Eduardo Leon, were nearly two second faster than the second-place finishers, Liza Finsness and her own Shiver. Hector Florentino (DOM) and Heliante Ter Wilgen, owned by Marion S. Head, were just two-tenths of a second behind Finsness. Bugatti, a 12-year-old KWPN gelding (Heartbreaker x Pilot), has been a successful partner for Genn for seven years. They have at least 10 grand prix wins to their credit and recently won two FEI grand prix events, one in Mexico City during the Longines Global Champions Tour and another at San Miguel de Allende, also in Mexico. Havens Schatt piloted Mostly Sunny, owned by CH Farms LLC of Delano, Minnesota, over the Steve Stephens-designed course to the win of the $30,000 Hunter Derby. In an exciting match-up of 40 top-notch horses and riders, Emma Kurtz and Dedication, owned by Dr. Betsee Parker, led after the first round with a huge score of 186 points but were left out of contention in the second round. Second-place finisher Kelley Farmer and Todd Minikus’ Exceptional were in fourth place after the initial round, with 178.5 points and added 185 points to their second round. Schatt and Mostly Sunny, a striking 10-year-old Zangersheide gelding, earned 364 evenly-split points to win the event just .5 points ahead of Farmer. 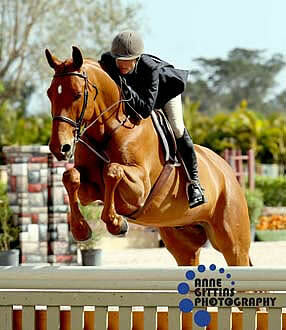 Caitlyn Shiels and Cassius, owned by Durpetti Equestrian LLC, were in the eleventh spot after the first round. The pair stepped up with an outstanding second round to take the third-place prize. Schatt imported Mostly Sunny from Europe when he was 5. A football fan, Schatt gave him his barn name, Larry, in honor of the legendary Arizona Cardinals receiver Larry Fitzgerald. As a 7-year-old, he was already competing in the High Performance Hunters and some derbies. His owner, David Lubben (CH Farms), now rides with top hunter trainer Scott Stewart and offered Schatt the opportunity to continue to campaign him as a derby horse. She was thrilled to have him back. “He’s my favorite horse ever,” she said. Schatt said that the first round rode very nicely but, for whatever reason, the handy round under the lights turned out to be challenging. After watching the first horse on the course, Schatt adjusted her plan. It worked out in their favor and earned them the victory gallop. “Flowers for the champions, trees and shrubs everywhere, the VIP tent between the hunter rings — for a venue where show at a lot, they know how to make it a special horse show,” she said about the Country Heir I & II management. James Chawke and GK Coco Chanel. Photos courtesy of Equinium Sports Marketing, LLC. Wellington, Florida (March 15, 2017) – Wrapping up its tenth week of competition, the 2017 Palm Beach Series has become a haven for developing horses and riders to hone their skills and synergy in the competition arena. In the third and final Hunter Derby Day of the 2017 winter season, an exceptional course welcomed riders for a $5,000 USHJA National Hunter Derby and $15,000 USHJA International Hunter Derby, where gorgeous jumps in shade of the covered arena set the stage for a utopian derby showcase on Friday, March 10th. Full jumper divisions hosted riders Wednesday and Thursday, with Saturday’s competition including the week’s headline class, a $15,000 1.40m Grand Prix designed to offer a technical but obtainable challenge for emerging Grand Prix mounts and riders. World class jumps, course designs, and a one-of-a-kind atmosphere drew riders to the in-gate of Jumper Rings 1 & 2 at the Jim Brandon Equestrian Center during Week 10’s competition, and Saturday’s 1.40m Grand Prix presented an interesting combination of challenges for the field of competitors. The headline class, which featured a course by FEI designer Mark McGowan, granted a number of double clears but no one could best James Chawke and GK Coco Chanel’s effort, which secured them victory. As one of the first riders to go, Chawke’s early jump-off time of 40.612 couldn’t be touched throughout the class. As all of the Palm Beach Series’ jumper classes feature an open in-gate policy, allowing riders to arrive, school, and show at their own pace and as per their own schedule, the majority of the field was still chomping at the bit following Chawke’s early double clear, but in the end none would best the elegant bay mare’s athletic display of speed and power. Giving chase to Chawke and Coco, Stephen Moore piloted to Istafan Issi to reserve honors with a jump off time of 44.553. Peter Jordan and P&F Cordillo Z rounded out the top three efforts in the Grand Prix, less than a second behind Moore with a 45.148. The spectacular Grand Prix course, which asked a number of questions of its horses and riders, offered the option of a straightforward ride with a few bending lines and combinations to keep things interesting, as well as the choice to test agility, scope, and stamina. Acting as a catalyst for the development of young or green horses as well as developing riders, the Palm Beach Series weekly Grand Prix classes, Hunter Derby Day events, and other jumper divisions serve as a stepping stone to the larger jumper classes without the pressure and stress of intense competitions and atmospheres. March 10 was an incredible season finale for The Ridge Palm Beach Series’ hunter derby competitions, and a celebration of the grace, athleticism, and pageantry that have come to embody the performance hunter and highlight The Ridge Palm Beach Series’ Hunter Derby Days. The spectacular jumps gave character and substance to the Derby courses, which were designed by Skip Bailey to test and reward some of the best hunter horse and rider combinations in the world. Including stacked hay bales, brick and picket verticals and oxers, stone walls, and lushly decorated fences, the final Hunter Derby Day of the 2017 winter season began with the $5,000 USHJA National Derby in the morning and the $15,000 USHJA International Derby in the afternoon. Hallie Buttenweiser and Wanderlust jumped with the presence and precision that are the hallmarks of an exceptional derby ride, earning them the championship title in the $5,000 USHJA International Derby. Wanderlust, who is known around the barn as Turkey, made a particularly strong statement in the handy round to earn himself and Buttenweiser the win in the horse’s first outing of the show season. With the arena freshly drug and the course reset for the $15,000 USHJA International Derby, it was decorated hunter rider Havens Schatt and Continental’s turn to shine. The athletic bay, under the guidance of Schatt, epitomized the talent and poise required to top one of the discipline’s most prestigious classes. After beginning his career as a 1.35m jumper, Continental has grown under Schatt’s guidance into a successful Derby horse as well as an exceptional amateur hunter. Filip de Wandel and Gentley. Photo Credit: ©ManciniPhotos. Wellington, FL – January 5, 2015 – Filip de Wandel of Mechanicsburg, PA and his own Gentley earned their first win of 2016, topping a competitive class in the $30,000 Nutrena Grand Prix at Palm Beach International Equestrian Center (PBIEC) on Sunday, January 3. De Wandel and Gentley impressed in the first grand prix competition of the New Year at PBIEC, crossing through the jump-off timers in 42.866 seconds to take top honors. Emanuel Andrade of Wellington, FL showcased immense talent around the jump-off track, finishing in second and third place aboard ZZ-Top VH Schaarbroek Z and Boy IV, respectively. Competition at PBIEC continues tomorrow, Wednesday, January 6, with the ESP Holiday Finale, which will highlight the final grand prix of the 2015 ESP Holiday Series, the $50,000 UHealth Ear Institute Grand Prix on Sunday, January 10, and will begin at 12:00pm. Gentley, a 2006 Belgian Warmblood gelding (Bentley x Ulatrice), was bred by de Wandel’s father, Antoine de Wandel, in Belgium, and began his career with Filip de Wandel at the young age of three. The seasoned duo mastered the track, completing a solid first round before dominating the jump-off. The pair also rode to a top three finish in the $10,000 UHealth Ear Institute Open Stake on Thursday, December 31, taking second place honors. The partnership formed between the pair in their seven-year tenure together has been proven with several successful results this season at the grand prix level. Earning their first ever career grand prix win together at PBIEC, de Wandel was elated with Gentley’s performance on Sunday afternoon. “He’s ten now and I’ve had him since he was just three years old. It’s been a very special partnership for us. He’s been doing the grand prix classes very well this year. He placed at the Hampton Classic over the summer and he’s brought home a lot of ribbons, but we never were able to get a win. It feels great to start this circuit off with a win under our belts,” he noted. With their first win in hand, de Wandel plans to use Gentley throughout the 2016 Winter Equestrian Festival (WEF) circuit and is hopeful the pair will be able to contest some of the larger classes offered throughout the season. De Wandel explained, “I think I will try to start this circuit off doing the CSI 2* and 3* classes and see how he handles them before we decide if he’s ready for something bigger. If he does well, we will try to go as far as we can with him because he is very talented. “He’s my only grand prix horse so I always need to be aware of what we’re doing with him. Our plan has been to only do five or six weeks throughout circuit. He’s started so well this year though that I think we’re in a place where we can hold off on the first week of WEF and do a CSI 2*. We’ll see how he does and go from there,” he continued. Melissandre Lincourt of Montreal, QC and Just Stella L stole the show in the $10,000 UHealth Ear Institute Open Stake on Thursday, December 31, at PBIEC. Lincourt and her own 2006 Oldenburg Springpferd mare (Singulord Joter x For Joy) Just Stella L dashed to the finish in 35.503 seconds. The duo narrowly edged Filip de Wandel and Gentley, who collected second place with a time of 35.56 seconds. Andrew Kocher of St. Louis, MO guided Ciana, owned by Eagle Valley Partners, LLC, to third place, crossing the timers in 36.414 seconds. The class of 32 entries saw six double clear rounds and fourteen combinations move forward to the jump off round. Havens Schatt of Georgetown, KY rode Game Day, a 2007 Dutch Warmblood gelding (Cristo x Ohio I) owned by Kelley Corrigan of Lexington, KY, to victory in the $5,000 USHJA National Hunter Derby on Friday, January 1, earning a first round score of 83.5 and a handy round score of 92, to receive an overall 175.5 from the judging panel. Schatt continued her success earning a second place aboard Breeze owned by John Yozell of Dedham, MA. The duo picked up a score of 86 in the first round and 87 in the handy round for an overall total of 173. Hannah Isop of Pawling, NY and Jackson, owned by Christine Watkins of Rowaton, CT, finished in third place with scores of 82 and 88 for a total score of 170. Competition at PBIEC will begin tomorrow, Wednesday, January 6, and continue through Sunday, January 10. The $50,000 UHealth Ear Institute Grand Prix will highlight the week as the last grand prix of the ESP Holiday Series before the commencement of the 12-week Winter Equestrian Festival circuit on Wednesday, January 13. For more information on PBIEC and to view a full weekly schedule, please visit www.pbiec.com. Havens Schatt and Custom Made. Lexington, KY – May 14, 2015 – Havens Schatt and Jennifer Alfano battled neck and neck for the blue ribbons on day one of the professional hunter divisions at the Kentucky Spring Classic. The two friendly leading riders and their horses were back it today, eventually tying for the grand championship. Beginning with the First Year Green Hunters, Schatt demonstrated her determination atop two entries, Custom Made and Capital City. In the over-fences class, Schatt piloted Custom Made to a first-place finish, ending up second in the handy and first on the flat to earn the division championship. Custom Made, who is owned by Shaw Johnson Price, became a minor celebrity after jumping out of the Rost Arena with Schatt aboard at the Winter Equestrian Festival, but today the 10-year-old gelding was on his best behavior. Schatt and Capital City were awarded the reserve championship for their winning handy round combined with a third-place and finish over fences. The Green and Regular Conformation Hunters were the next to show, with both Kelley Farmer and Peter Wylde in contention for the top spots. In the over-fences class, Farmer took home the blue atop Back Story, the big bay gelding owned by Tia Schurecht. The pair finished third in the handy and first on the flat, racking up enough points for the division championship. Wylde and Levland, the 8-year-old entry owned by The Levland Group, were hot on her heels, taking home first place in the handy and coming in second to Farmer over fences and on the flat. The duo earned the division’s reserve championship for their efforts. The day continued with the Second Year Green Hunter division, with Alfano and Schatt returning to face off once again. Schatt and Set to Music, owned by Deborah Perkins, improved from Wednesday’s second-place finishes, delivering three winning rounds to sweep day two and earn the division’s championship. The duo also accumulated enough points to tie Alfano and High Performance Hunter Maggie May for the overall co-grand championship. Rounding out the Second Years were Alfano and Candid, the previous day’s victors. The pair finished second over fences and third on the flat, earning the reserve championship. It was Alfano’s time to shine in the High Performance Hunters with Helen Lenahan’s Maggie May. The mare won four out of the division’s five blue ribbons, earning the championship and joining Schatt for the overall co-grand championship. The division’s reserve champion award went to Schatt and Mostly Sunny, the flashy chestnut owned by CH Farm LLC. Coverage will continue Friday with the USEF Platinum Performance Talent Search 2*. Saturday is “Derby Day,” with the $5,000 Hallway Feeds USHJA National Hunter Derby taking center stage. Lexington, KY – May 14, 2014 – Today marked the beginning of the Kentucky Spring Classic and an impressive start to the spring show season for Caroline Moran’s Bacardi. With Havens Schatt in the irons, the gray gelding earned consecutive scores of 92 for back-to-back wins in the Second Year Green Hunters at the Kentucky Horse Park. While one would never guess it after watching his rounds today, the Kentucky Spring Classic marked Bacardi’s first return to the show ring after more than a month off and an unusual winter in Florida. With their two first place finishes, Schatt and Bacardi sit as the clear front runners heading in to day two of professional hunter competition in the Stonelea Ring. Christopher Payne and Channing and Jennifer Smith and As Always follow them closely, as both pairs turned in impressive performances over the Bobby Murphy designed courses to each earn a second place finish in today’s two over fences classes. In the High Performance Hunter division, it is Scott Stewart and Everly and Kelley Farmer and Mindful who sit tied at the top heading in to tomorrow. Both horses received identical scores of 93 and 90, with Stewart and Everly taking the 93 and the top call in the first class and Farmer and Mindful topping the field with the 93 in the second class. Similarly to Bacardi, Everly has enjoyed several months off after last showing during Week VI of WEF, and the mare, owned by Dr. Betsee Parker, returned to the ring today at the top of her game. This afternoon in the Rolex Stadium, the 1.40m Open Jumper speed class was the highlight event. Twenty-eight riders showed over Michel Vaillancourt’s track, before the class had to be stopped due to strong storms in the area. The leader before the class was put on hold was Emanuel Andrade and AD Vangelys, owned by Hollow Creek Farm of Aiken, SC. The pace to beat was set early by Pablo Barrios and Hollow Creek Farm’s Crossfire 10 at a clear 60.834 seconds, but Andrade followed two rounds later. Andrade and AD Vangelys sliced the turns, and the pair was able to cross the finish line in a speedy 58.871 seconds to take over the lead. The only other rider to come close to Andrade’s time was Juan Ortiz and Korkade, who finished in 60.519 seconds. There were still 13 riders set to return, and they will have the chance to try and catch Andrade’s time tomorrow morning at 8 a.m. The 1.45m Open Jumper class was moved to Thursday afternoon. For an updated schedule, please visit www.kentuckyhorseshows.com. Tomorrow afternoon’s main event will be the $25,000 Hagyard Lexington Classic. 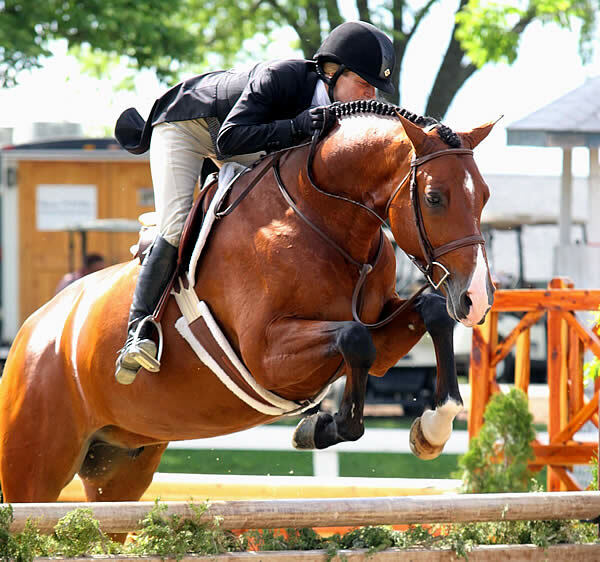 Riders will also have the opportunity to showcase their mounts during Saturday evening’s $75,000 Mary Rena Murphy Grand Prix, sponsored by Audi of Lexington. The hunter riders will return to the Stonelea Arena tomorrow for the conclusion of the professional hunter divisions, and on Saturday evening they will vie for the winning honors in the $5,000 Hallway Feeds USHJA National Hunter Derby. Todd Minikus and Quality Girl. Photos © Sportfot. Wellington, FL – January 23, 2014 – Week three of the 2014 FTI Consulting Winter Equestrian Festival (FTI WEF), sponsored by Fidelity Investments, continued on Thursday afternoon with a shared victory for Todd Minikus (USA) and Quality Girl and Tiffany Foster (CAN) and Victor in the $34,000 Ruby et Violette WEF Challenge Cup Round 3. Held in a “California Split” due to the large number of entries, the competition awarded two sets of placings, each with $34,000 distributed. Week three of FTI WEF competition continues through Sunday, January 26. The week will feature the $34,000 Spy Coast Farm 1.45m on Friday, the highlight $125,000 Fidelity Investments Grand Prix CSI 3* on Saturday night, and the $34,000 Suncast 1.50m Championship Jumper Classic on Sunday. The FTI WEF, held at the Palm Beach International Equestrian Center (PBIEC) in Wellington, FL, features 12 weeks of world-class competition through March 30, awarding $8 million in prize money. Brazil’s Guilherme Jorge set the course for the $34,000 Ruby et Violette WEF Challenge Cup Round 3 on Thursday in the International Arena at PBIEC. The class saw a total of 92 entries with 24 clear rounds advancing to the jump-off. Twelve jumped clear over the short course, and Todd Minikus and the Quality Group’s Quality Girl had the fastest time of 40.34 seconds overall for the win in Section A of the class. Tiffany Foster and Artisan Farms LLC and Torrey Pines Stable’s Victor finished in 40.50 seconds for the win in Section B. The top three finishers in Section A included Minikus and Quality Girl, Ian Millar (CAN) and Dixson, owned by Ariel and Susan Grange, with their time of 40.84 seconds, and Eric Lamaze (CAN) with Artisan Farms LLC’s Zigali P S in 43 seconds flat. Section B saw a top finish for Foster and Victor, with Kent Farrington (USA) and Amalaya Investments’ Willow in second in 41.80 seconds, and Meredith Michaels-Beerbaum (GER) and Octavia Farms’ Checkmate 4 in third in 43.52 seconds. “Things kind of just came up nice for me in the turns, and it all worked out,” Minikus said of his jump-off round on Quality Girl. He also had a second chance in the jump-off with Legacy Stables’ Uraguay and did his best to get both top spots, but had an unfortunate stop in the short course. In addition to the prize money in Thursday’s class, Minikus earned a special $3,000 bonus as part of the SSG ‘Go Clean for the Green’ promotion for wearing his SSG ‘Digital’ Riding Gloves. Each week of the Ruby et Violette WEF Challenge Cup Series, a $3,000 bonus will be awarded to the winning rider if they are wearing SSG ‘Digital’ Riding Gloves in all rounds of competition with the SSG logo clearly visible. An $8,000 G&C Farm 1.45m class was also held in the International Arena on Thursday morning with a win for McLain Ward and Alain van Campenhoudt’s Citizenguard Million Dreams. The $2,500 Amateur-Owner Jumpers, sponsored by Engel & Völkers, Sollak Carr, saw a win for Abigail McArdle and David McArdle’s Cosma 20. Havens Schatt and Bacardi are already off to a good start in 2014. In the seven-year-old KWPN gelding’s first show of his second green year, Bacardi and Schatt were champions of the Equine Tack & Nutritionals Second Year Green Working Hunter at FTI WEF on Thursday afternoon. Schatt piloted Bacardi to four blue ribbon rounds over fences and placed third in the under saddle class. Schatt and Bacardi had quite the year during 2013 in the First Year Green Working Hunter division. Together they picked up seven division championship titles, culminating with being crowned Grand Green Hunter Champion at the Pennsylvania National Horse Show in Harrisburg, Pennsylvania. Caroline Moran, Bacardi’s owner, was thrilled to see her gelding off to an equally successful start in 2014. Bacardi and Schatt topped their final over fences round on Thursday with an astounding score of 97. “I didn’t think he could beat himself when he was a First Year horse, but I think he’s jumping the Second Years even better. He is just an amazing horse,” Moran commented. Bacardi’s steadfast attitude in the show ring is what Moran believes gives him his edge. “He’s just so consistent. He can be a bit of a brat at home, but whenever he comes to the ring he’s all business and is just a consistently good horse. In my opinion, he’s getting better and better,” she continued. “I had in my heart that he could be an amazing horse and I really felt that if you rushed him, you were just going to turn him the wrong way. He was a little bit tricky at first, but it was more just to let him go at his speed than push him to do something he wasn’t really ready for,” Schatt described. “My job is young horses and making sure they’re ready for their amateurs. He’s really the only horse that I’ve ever had that’s been really just for me. I’ve not really had an owner that let me have a horse and do [what I want],” Schatt explained. “She’s such a great person. She loves the horses as much as I do. If he didn’t want to do Second Years for some reason, with what he’s won and what he’s done with her, she would do adult [amateurs] or just play with him. He has a home forever and she’s a great, great person,” Schatt expressed. Week three of the 2014 FTI Consulting Winter Equestrian Festival will continue on Friday with the $34,000 Spy Coast Farm 1.45m in the International Arena and the presentation of championship honors to the Adult Amateur Hunter 18-35 Section A in the Rost Arena. For full results, please visit www.showgroundslive.com. Havens Schatt and Just Fred. Lexington, KY – May 18, 2013 – Havens Schatt and Just Fred were just about flawless in tonight’s $5,000 Hallway Feeds USHJA National Hunter Derby. 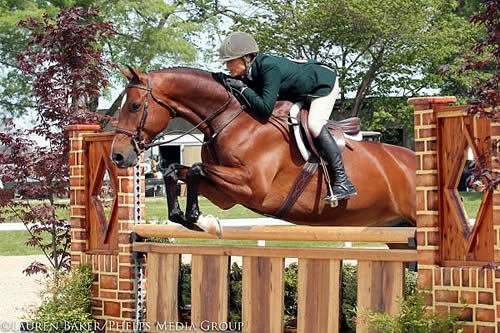 Schatt and Just Fred, owned by R. Bruce Duchossois of Aiken, SC, claimed the victory in what is one of the Kentucky Spring Classic’s most highlighted hunter events. The class, held today in the Stonelea Ring at the Kentucky Horse Park, is the second in the seven-part Hallway Feeds Series in which top riders from across the country vie for their share of the $15,000 Leading Rider Awards. Tonight’s ten obstacle first round course set by Bobby Murphy featured a number of bending lines and rollbacks all set at 3′ with four 3’6″ option fences. If cleared successfully, the higher options were each worth an additional point added to each of the judges’ scores. From the opening field of 32 horse and rider pairs, the top 12 scoring combinations made the cutoff to come back for the handy round course, also designed by Murphy. The handy course featured nine obstacles, many of which were built to imitate the fences a rider would face on the hunt field. It presented riders with even more tight turns and rollbacks and different options to showcase their horses’ handiness. Kelley Farmer returned to the handy round in the third place position with a first round score of 90 aboard Red Sky, owned by Dr. Kenneth and Selma Garber and Larry Glefke of Keswick, VA. Farmer and Red Sky took all of the higher options over the second course to earn a handy round score of 87, for a grand total of 177 over both courses, which would end up cementing their spot in third place for the night. Farmer’s high score in the first was overtaken by Schatt and Just Fred, who returned as the second to last to go with a first round score of 91. The pair skillfully maneuvered the handy course to earn a base score of 84, plus four additional points for taking each of the higher options for a total second round score of 88. That score combined with their first round score of 91 moved them into the first place position with an overall point tally of 179. Farmer was back again as the final rider to return, this time with Skorekeeper, owned by Larry Glefke and Quail Run Partnership of Keswick, VA. The seven-year-old horse earned a total first round score of 94 to shoot him to the top of the leader board going back in to the final round, but a slight chip to the third fence of the handy course would leave him with a second round score of 84. That 84 left Farmer and Skorekeeper with a final point total of 178, just one point behind Schatt and Just Fred for the second place award. Both Skorekeeper and Just Fred are brand new to the hunter derby field and are already making their mark in winning style. 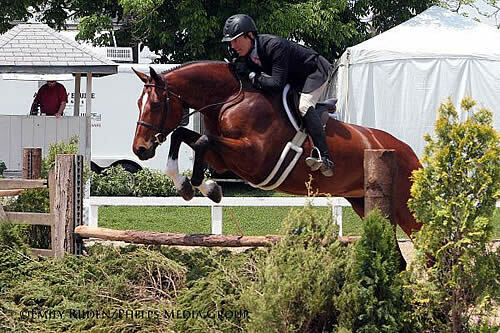 Both made their derby debuts just last weekend, at the Memphis in May USHJA International Hunter Derby for Skorekeeper and at the first $5,000 Hallway Feeds USHJA National Hunter Derby for Just Fred. The Hallway Feeds Hunter Derby Series returns at the Kentucky Summer Horse Show, with the third class in the series being held July 27. The Hallway Feeds USHJA National Hunter Derby Series would not be possible without many generous sponsors including Hagyard Equine Medical Institute, Central Equipment, Alfagreen Supreme, Sweet PDZ Horse Stall Refresher, Caddel Equine Therapy Center, KER Sport Horse Nutrition, The Tack Shop of Lexington, Turf Town Properties, Trouw Nutrition and PNC Bank. Hunter competition continues tomorrow at the Kentucky Horse Park as the Kentucky Spring Classic comes to a close with the awarding of the Small Junior Hunter and Children’s Hunter championships. Conor Swail and Martha Louise. Photo © Sportfot. Wellington, FL – March 14, 2013 – Ireland’s Conor Swail and Chinook Valley, Inc.’s Martha Louise were victorious in Thursday’s $33,000 Ruby et Violette WEF Challenge Cup Round 10 during week ten of the 2013 FTI Consulting Winter Equestrian Festival’s (FTI WEF), sponsored by Horseware Ireland. Week ten’s competition runs March 13-17 at the Palm Beach International Equestrian Center (PBIEC) featuring CSI 3* competition. Highlights include the $33,000 G&C Farm 1.45m on Friday, the $82,000 Horseware Ireland CSI 3* Grand Prix on Saturday, and the $33,000 Suncast 1.50m Championship Jumper Classic on Sunday. Tomorrow night’s exciting line-up of events at the Adequan Global Dressage Festival at The Stadium includes the $10,000 Head-to-Head Competition over the high jump “Puissance” wall at 6 pm, the FEI Grand Prix Freestyle presented by Horseware Ireland under the lights at 7:30 pm, and The Yale Spizzwinks (?) A Capella singing performances. General admission and parking are free, and there will be fantastic raffle prizes handed out to general admission seat holders. It will be a night of power and grace for equestrian sport that you won’t want to miss! 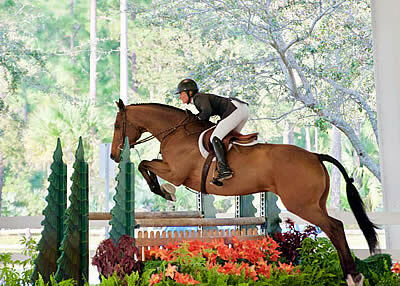 The 2013 FTI Consulting Winter Equestrian Festival features 12 weeks of competition running from January 9 – March 31, 2013, and will be awarding almost $7 million in prize money throughout the circuit. Olaf Petersen, Jr. of Germany set the course in the International Arena for Thursday’s Challenge Cup class with 64 entries, 13 clear rounds to advance to the jump-off, and five double clear efforts over the short course. Conor Swail and Martha Louise, a nine-year-old Swedish Warmblood mare by Maloubet de Pleville 1039 x Wolfgang, had the leading time in 42.53 seconds. Swail got Martha Louise last year and had a great season with many top placings, including wins in the Gijon and Dublin 5* shows in Europe. The mare is just starting up with her season this year and has not shown a lot yet, but proved to be back in form with a great win on Thursday. Swail went second in the jump-off and had to beat a fast pace set down by Charlie Jacobs and Flaming Star. He explained his strategy. With a smaller class and some of the top horses taking a break after last week’s CSI 5* competition, Swail thought the class was a perfect way for Martha Louise to start the season. Charlie Jacobs (USA) and CMJ Sporthorse LLC’s Flaming Star finished second in 43.72 seconds. Lauren Tisbo (USA) and Tequestrian Farms LLC’s Roundthorn Madios were third in 44.47 seconds. Heather Caristo-Williams and M/M Ralph Caristo’s Evening Star placed fourth in 44.49 seconds. Fifth place honors went to Japan’s Taizo Sugitani and Yvonne Young’s Avenzio 3 with their time of 47.39 seconds. Along with his winning prize money, Swail was also presented with a special rider’s bonus for the SSG “Go Clean for the Green” promotion. A $3,000 bonus is offered each week if the winning rider of the Challenge Cup class is wearing the SSG ‘Digital’ Riding Gloves in all rounds of competition with the SSG logo clearly visible. Havens Schatt and Smiles had plenty to grin about after earning championship honors in the Lucas Equine Equipment Performance Hunter 3’3″ division during week ten of the FTI Consulting Winter Equestrian Festival (FTI WEF). Schatt and Smiles, a ten-year-old Dutch Warmblood gelding owned by Bruce Duchossois, bested the division with consistent performances over two days of competition. Day one, the pair won the under saddle and placed first and third over fences, followed by second and fourth place finishes on day two. Hayley Barnhill and Missy Luczak-Smith’s Surf’s Up were reserve champions after two blue ribbon finishes over fences on day two. Schatt enjoyed the opportunity to ride one of her more mature mounts in a new environment. “Ring 7 can be hard because of the jumper horses being nearby. Today’s classes followed the Pre-Greens, so the courses were simple, but built very nicely. I deal with a lot of younger horses and so it was nice to be on an older horse that you know will be good in a new venue,” Schatt explained. “I’ve been riding Smiles for about a year and a half, and he’s been a pleasure throughout,” she continued. “He does anything you ask him to do in any ring you ask him to do it in. He’s a very easygoing dude,” Schatt smiled. While Schatt is no stranger to the winner’s circle with her talented string of hunter mounts, she especially appreciates her close bond with Smiles. “I know him really well and I know every time I get on him exactly what I have, which isn’t always the case with the young ones. He’s very consistent, which is really nice,” Schatt described. Schatt and Smiles are currently in first place in the FTI WEF circuit championship standings for the division. Schatt credits their success to Smiles’ striking presentation and remarkable natural talent. “He’s bigger and he’s all chestnut, so he’s very elegant and stands out a little bit. He always jumps the same with great follow-through behind. He jumps as well behind as he does in front. He can jump high with so much ease, has beautiful movement across the ground, and you don’t have to pull on his mouth. He gets in one rhythm where everything just happens,” Schatt concluded. Schatt will continue to ride Smiles for the duration of the FTI WEF in addition to owner Duchossois, who will return to the Amateur-Owner 3’3″ divisions with Smiles during week eleven of the FTI WEF. Week ten, sponsored by Horseware Ireland, will continue Friday when the Camping World Adult Hunter 51 & Over Section A names its champion in the Gene Mische Grand Hunter Arena. The $33,000 G&C Farm 1.45m will be featured in the International Arena during the day and the $35,000 G&C Farm Puissance will be held at The Stadium at PBIEC in the evening. For full results, please visit www.showgroundslive.com.